An innovative earth anchor-based approach minimizes the environmental impact of solar, reduces costs, and increases relocatability of PV plants. The new NUANCE ENERGY-THEnergy Report “Modular, semi-portable mounting systems for solar in the mining sector” focuses on a product innovation that has several advantages for remote off-grid mines. This is mainly due to the fact that the solar systems are built next to the mining off-takers. For mines in production and even more so in mining exploration, the lifetime of the solar system often does not correspond to the need for power at a specific location. Mining camps are relocated rather frequently, and mines at production stage often have a planning horizon below the 25-year lifetime of the solar power plant. This might be due to deposit sizes, mining permits, or economic reasons. In the case where independent power providers supply the solar electricity through a power purchase agreement (PPA) to the mine, this translates into a counterparty risk. Even if the mine operators have committed long-term, the economics of the mine must ensure that the solar energy is actually paid. If the client fails to pay, typically there are no other off-takers at these remote locations. Optimized mounting systems allow for dissembling, relocating, and re-erecting the solar array in a different location. The earth anchor approach is one of the most advanced solutions because it also reduces installation costs and environmental impact. In the Osprey PowerPlatform technology, earth anchors secure the foundations of ground-mount solar arrays to the underlying terrain. Earth anchors can be deployed in a wide variety of substrates as they work in virtually any type of soil, on any site—even under the most challenging of conditions, such as in desert hardpan, rocky soil, permafrost or on most landfills. The earth anchor, once positioned, relies on an upward radiating cone of soil which may weigh as much as 2000-3000lbs (1000-1500kg) of resistant force. The earth anchor approach has several advantages over traditional foundations. Less material use means lower direct costs and transportation costs. The Osprey PowerPlatform eliminates the need for large scale utility vehicles such as cement trucks and pile driving machines as it installs to the ground with basic tools that one man can carry, handle and operate. The simplicity of the solution results in shorter installation times and lower labor costs, and greatly reduces the amount of skilled labor needed. For mining applications, these advantages translate into overall cost-savings for constructing the solar power plant. Lower costs for relocatability means that shorter power purchase agreements become economically viable. “For remote applications, the advantages of our system are even bigger than for standard solar plants. Therefore, we see an excellent fit for our solutions in off-grid mining”, explains Brian C. Boguess, Nuance Energy’s CEO. 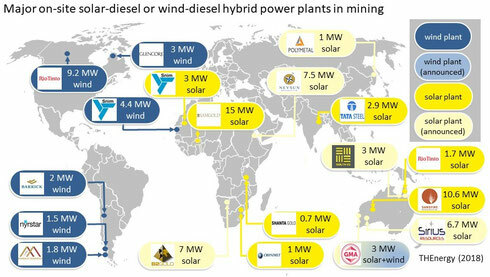 “One of the main obstacles for solar power in mining is that miners struggle to commit to long term PPAs. Flexible mountings systems such as the Osprey PowerPlatform are crucial for shorter PPAs,” says Dr. Thomas Hillig, Managing Director of THEnergy. An interesting aspect is that earth anchors have been successfully used in mining applications for providing the foundation of fabric buildings.